While you may think it’s time for a new website, there are a few things to do first before jumping headlong into an update. After all, you may just need a few critical updates. Or you may need an entirely new website. 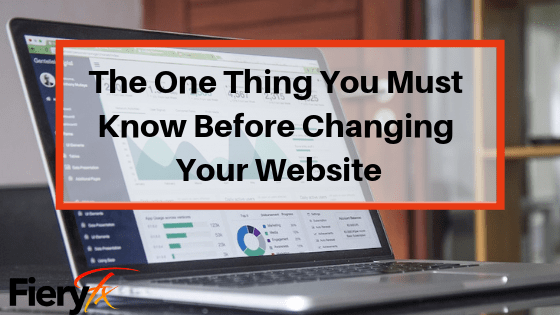 So, before you go changing your website, get ready to learn the one thing you must know first. Where Does Your Website Stand Now? No need to jump the gun here. First, before you do anything else, you need to know what’s happening on your website right now. What are people doing when they visit the site? Are they clicking on certain things? Are they looking at the pages for any length of time? What is the path that they’re following to navigate your site? After all, the worst thing to do would be to screw up something that’s currently working. To figure out your baseline, you need to look at your analytics. Your website analytics are the key piece of information that you must—without exception—have before you start to do anything with your site. It doesn’t matter if you have the world’s leading expert on website design; without data, you’re going nowhere fast. Don’t have Google analytics running on your website? That’s okay; find someone who can help. But just don’t go changing your website without looking at your analytics. Without knowing where you stand, you might mess something up or miss an area of improvement. At FieryFx, I love sharing information. So stay tuned to this blog, follow me on Facebook, or watch my videos on YouTube. I’m always here to provide hints to make the most of your digital marketing.